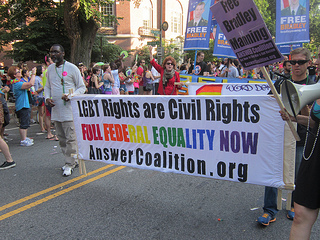 Chapters of the ANSWER Coalition have been hard at work mobilizing for LGBT Pride parades across the country. Already we have been enthusiastically received by crowds in Long Beach, Washington D.C. and Los Angeles. There are still many upcoming opportunities to stand up for equal rights! We will raise a militant demand for full federal equality in every sphere of society, something that only a mass movement can achieve. Pride has its origins in the fighting LGBT movement of the 1960s and 1970s, as thousands of LGBT people poured into the streets demanding their rights. Now, decades later, equal rights for LGBT people are still under attack, anti-LGBT violence is on the rise, and many LGBT youth facing extreme bigotry have taken their own lives. Now is the time for us to continue the struggle for full equality in the streets with a united and militant fight back movement. Below is a listing of upcoming Pride parades that ANSWER will be participating in - we encourage all our supporters to join us! Meet up with the contingent at 1:30 p.m. Centre St. between Charles St. and Cathedral St. The parade kicks off at 3:30 p.m. from Read and Charles Sts. in Mount Vernon and travels four blocks north up Charles St. to Chase St.